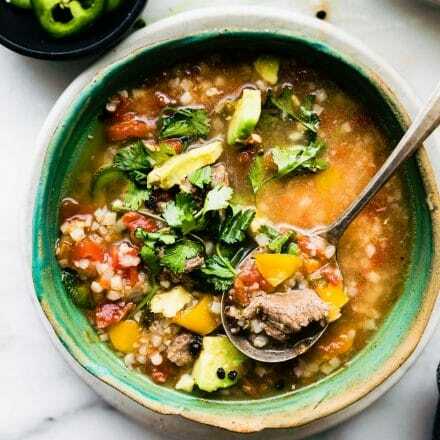 Everything But the Kitchen Sink Soup is a HEALTHY soup recipe using holiday leftovers. This easy soup recipe has instructions for cooking in an Instant Pot or on a stove top. 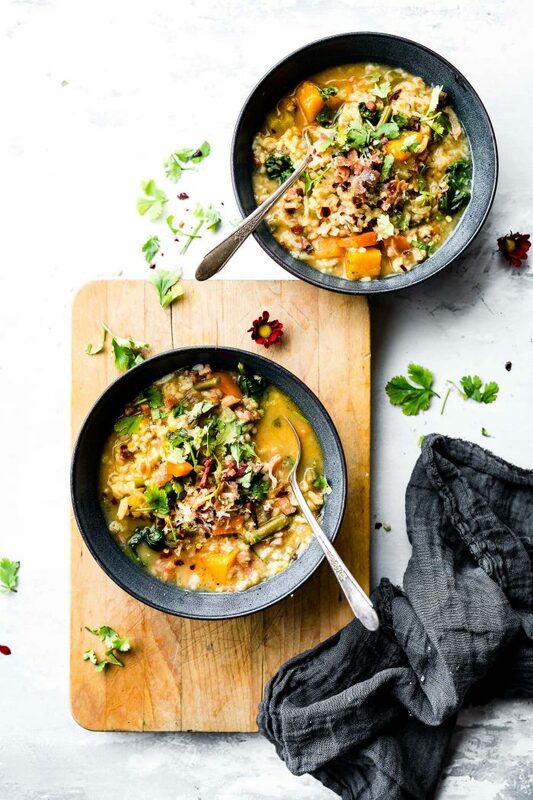 Add your leftover ham or turkey, plus any leftover veggies to this rice-based soup for an easy, flavorful, gluten-free lunch or dinner. Look! It’s not a holiday dessert post. It’s about time we saw some veggies around here, right? I thought our blood sugar might need a little break before Christmas. But don’t you worry, this veggie packed recipe is still come in extra handy for the holiday season. Ya’ll, it’s Everything but the Kitchen Sink soup! Please tell me you know about this crazy easy delicious soup? The most resourceful soup recipe ON DA PLANET! It requires everything but your kitchen sink! Well all that’s edible that is. 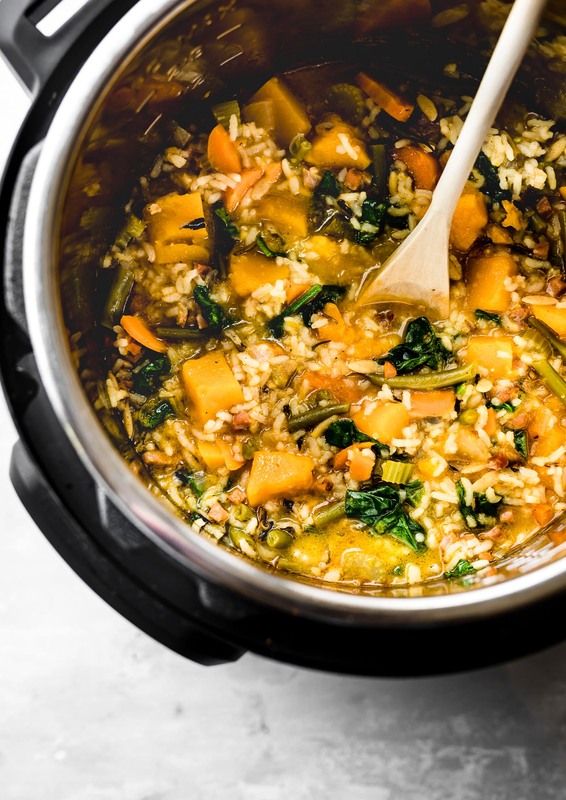 This kitchen sink soup recipe has an instant pot version, which means it’s ready in less than 25 minutes. It also has a stove top version that is ready in under 45 minutes. Whoa, I am liking this plan! Alright, before I jump to the recipe and explain what exactly is in THIS Everything But the Kitchen Sink Soup, let’s talk. I know, you’re probably SOOOO over me talking, but you must hear me out on one wee little issue. Mmm k? You see, we have 2018 just around the corner. A new year and new focus! Ya’ll, this year was HARD and I do apologize for the lack of transparency around here, but I couldn’t even get the words to figure out what to say. Although I can say this, I am guilty of putting work fist. Yep, I put my head down and just worked worked worked. Now I’m coming up for air and looking forward to feeling refreshed and renewed in 2018. Refreshed in my health, my marriage, as well as this job HERE! A job where I get to SERVE you with JOY! I’ve created a survey that might pop up when you hang out on CC (Cotter Crunch) for a while. If you could take the time to fill it out, I would appreciate it. I’ll send you my other PAID ebook for free if ya do! Just let me know. K? The link is here. Moving forward, literally and figuratively. 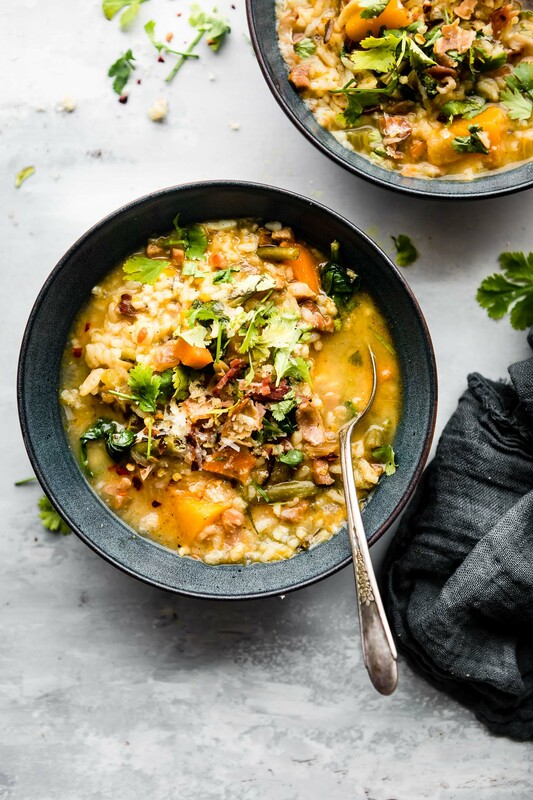 This Everything But the Kitchen Sink Soup is everything you ever wanted in a leftover vegetable soup recipe. I might be exaggerating but you get the picture. This first time I made this soup was over 3 years ago. I remember it so vividly because it was the only the second time I had used a DSLR camera and I was practicing photography. I must have made this Kitchen Sink Soup 3 times. We had so many holiday leftovers that I wasn’t about to waste. Plus, I was determined to practice my photography and to feed my husband, who just so happened to be training for an Ironman. Did I mention we were a wee bit frugal and broke back then too? Wow, I guess you could say this soup was quite valuable! Not to mention the most economical and tasty way to serve leftovers. Alright, speaking of leftovers, go look to see if there are any of these ingredients lingering in your fridge. Ham, roast chicken, turkey, or even legumes to make a vegan protein option. bacon or pancetta (feel free to skip make this vegan). In this updated Everything But the Kitchen Sink Soup I’m utilizing my instant pot (with stove top option of course). You’ll also noticed that I am using pancetta or uncured bacon to sauté the vegetables first. NERDY NUTRITION TIP —> The fat (that comes from the olive oil and bacon) helps us to absorb more of the fat soluble vitamins in this soup. 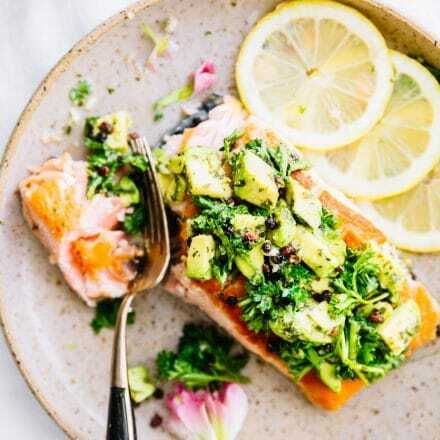 Vitamins such as Vitamin A,D,K, and E are much better absorbed into your bloodstream when you eat them with a little fat. And since this leftover soup is packed with vitamin rich veggies, we need a little fat to boost nutrition. Plus it’s so flavorful! Phew! Enough talking. Let’s EAT! 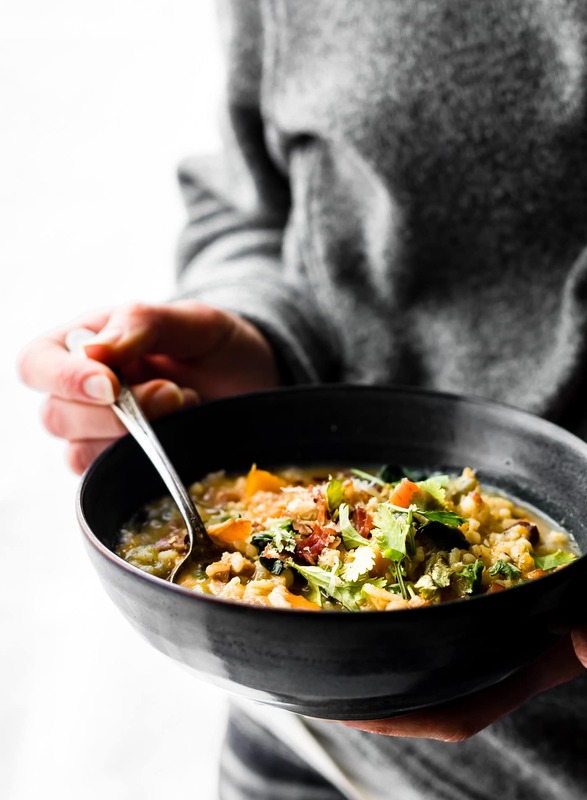 Everything But the Kitchen Sink Soup is a HEALTHY soup recipe using holiday leftovers. 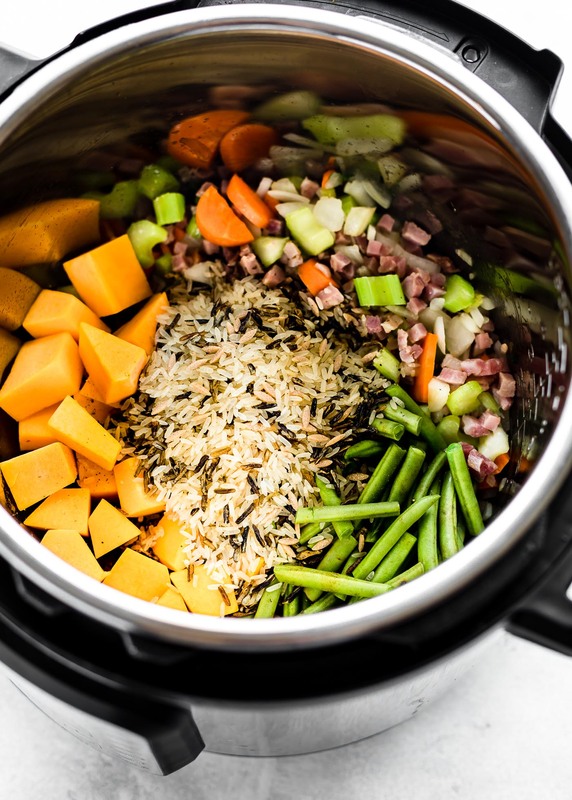 This easy soup recipe has instructions for cooking in an Instant Pot or on a stove top. Gluten free, Dairy free option. Optional additional Add-ins: 4-5 ounces Roasted turkey, smoked ham, chickpeas, etc. First make sure all your vegetables and meats/bacon are chopped or sliced according to measurements in ingredient list. for 2-4 minutes until onions are transparent and fragrant. Add your diced squash and sauté again for another 2 minutes. Stir in your garlic, paprika, and cumin. Mix together. Finally, add in your rice, broth, green beans, kosher salt, and pepper. After 12-14 minutes, use Quick release option to stop cooking. Then add in your spinach, stir, and seal it back up. Place on warm for 10 minutes until spinach is steamed. Once spinach is steamed, uncover and add sea salt. Serve and garnish with shredded Parmesan, cilantro, and crushed red pepper flakes. Feel free to add in ham, roast chicken or turkey with the spinach while warming. See notes for stove top version and vegetarian version. Make sure all your ingredients are prepped/chopped. for 4-5 minutes until onions are transparent and fragrant. Add your diced squash, garlic, and the rest of your spices and sauté again for another 2-3 minute. Add the broth, bring to a boil, then add your rice and reduce heat. Place on low covered for about 20- 25 minutes or until rice is cooked. If you are using wild rice it will take a little longer. Mix in your spinach and any other add-ins of choice. Cover and simmer for another 5-8 minutes or until spinach is wilted. Once cooked, add a pinch of sea salt. Serve and garnish with Parmesan, cilantro, and red pepper flakes. *To speed up both Stove top and Instant pot version, you can use precooked rice. For Instant pot cook 10 minutes then place on warm with spinach. For Stove top, just cook 10 minutes after bringing to a boil, versus 25 minutes. Do not add the bacon, instead add in a few teaspoons of tamari sauce, an extra pinch of paprika or smoked paprika, and 1 1/2 cups cooked (or canned, drained) chickpeas with your rice and vegetables. What’s your favorite way to utilize holiday leftovers? I also love making my turkey nacho salad and Vegan Salsa Con Queso, both made from leftover vegetables and holiday eats! Ya’ll, IT’S AMAZING! Did you your grandma ever share her KITCHEN SINK SOUP RECIPE? What was in it besides the sink. Cheers friends! Have a wonderful Holiday! I’ll be back in a week with one last secret recipe. It’s about time I get off the dessert train!! This looks totally yummy! Packed with all the good things my diet needs right now! Happy Holidays! 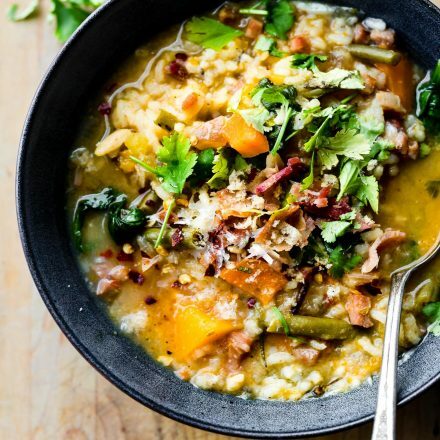 The perfect cold weather soup! This is my kind of soup!! Oddly enough, my family never really ate much soup. Except for matzo ball soup – we loved that. HA! Now I really like it though. 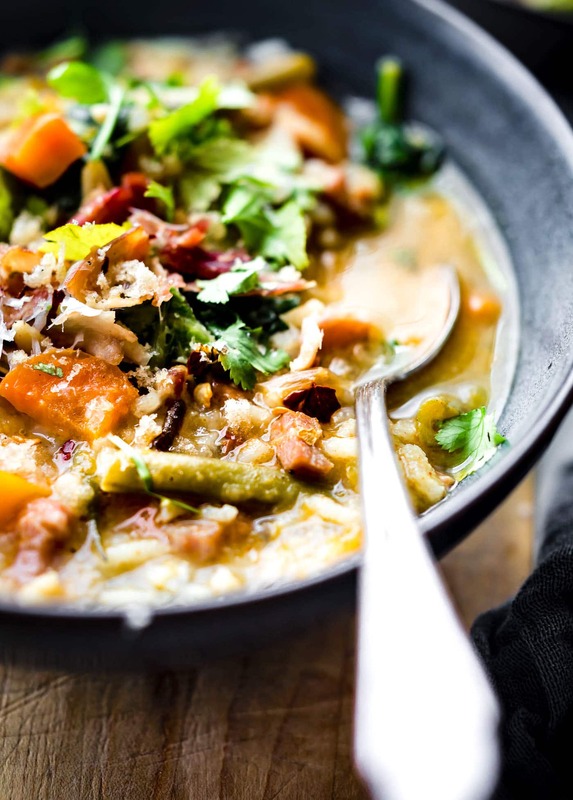 These kitchen sink soups are so perfect for the end of the week. I love this! Do you have a GF matzo ball soup recipe? I am dying to try one! 1000 times yes! I could eat this for lunch every day! Packed full of so much goodness, love this leftovers idea! My kinda soup! 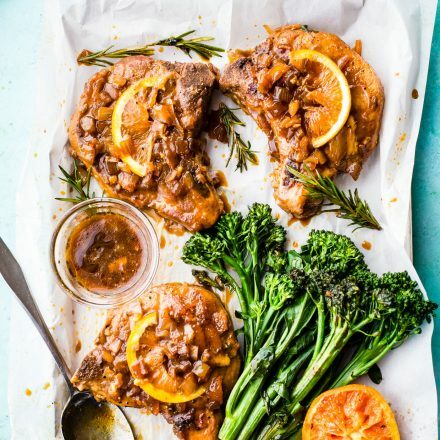 Looks hearty and so flavorful! So pretty! Love these colors! This looks so good, girl! 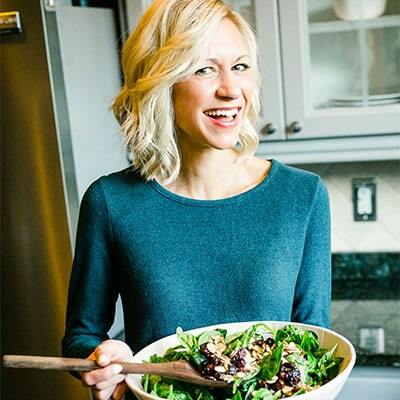 And these kinds of recipes are always my favorite – just mixing odds and ends, cleaning out the crisper drawer and pantry. They always turn out so tasty. And I get a a lot of satisfaction out of repurposing leftovers! Beautiful photos. Looking forward to 2018! mine too! All the flavors make me happy and I feel nourished. Your pictures are amazing! Its crazy to look back and see how much you grow. Thank you friend! The feeling is mutual! So excited for more of you amazing work in 2018! This soup has everything I want in a meal! Yes to vegetables Lindsay . YES YES YES! I’m usually one for making up lots of Curry’s so as to use up the leftovers at this time of the year, but I wanted something different and THIS is SO HITTING THE SPOT! Thank you. Hope you are doing well! Oh i love your curry recipes! Must make one soon! So good to hear from you Neil. And hi to Lynn! Such a good leftover hack!!! The soup was delish and very flavourful. I did not add cumin but extra paprika and it was really really good. Will do it again for sure. Thank you! Comforting massive pots of veggie soup or chili or any other kind of soups makes me SOOO happy for winter. And they also make my tummy happy. 🙂 HAPPY NEW YEAR Lindsay! Love ya friend. Are there any vegetable that you really shouldn’t use? Like mushrooms? Also, can you use any frozen vegetables or squash? I wouldn’t use mushrooms or radishes. But frozen veggies work great! Maybe a mix? I used frozen green beans and squash before. It’s perfect! 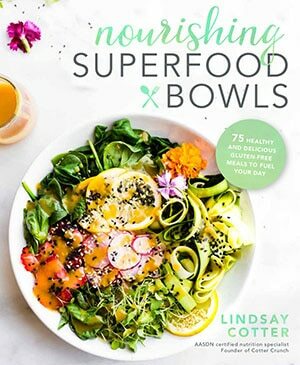 love this, still craving soup into a very cold spring, so thank you for a new recipe, at least to me! Soup is always good to eat. Good for health and it also feed your stomach fully. 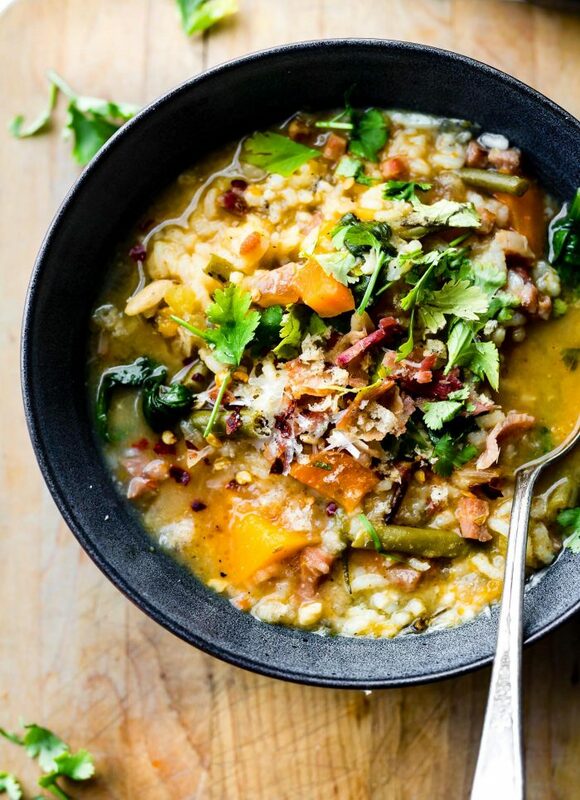 Soup with vegetables and rice will full your stomach. 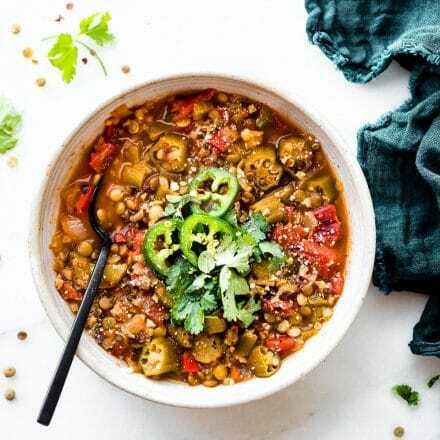 These vegetables and rice gives you some different but a delicious taste. I have just tried two of your recipes the last two nights as I was trying to find recipes for the produce from my CSA. This was one of them and both were absolutely fantastic! What I loved about this one is I substituted several things and it still turned our amazing! I did the instapot version. So Good!!! Ahhh, this is a leftovers masterpiece!